”EA Sports, Its in the game!” – a tag line delivered in every EA Sports game by the cultural icon, Andrew Anthony. Such is the sound that became the trademark in the ears of football lovers across the globe. It is not just a memorable catchphrase we mimic while staring at the loading screen, it is also the sound of anticipation. This phrase resonates in the hearts of fans giving them hope that every year there will be something different and that EA will deliver something far more superior. Well, EA’s new FIFA game has finally been released for iOS and Android devices. While previously it was called EA SPORTS FIFA when it was soft launched in Canada, it has been renamed into FIFA 16 Ultimate Team [Free]. As great football fans ourselves we had to grab it and it was definitely a great experience. But first let’s put some facts into perspective. Foremost, among the circles of FIFA’s connoisseurs it is a well-known fact that this franchise accounts for a a considerable percentage of EA’s total income; demonstrating the importance of this title for EA. The new title’s “all-new engine” shares a lot in common with its console cousin and promises exciting features and a more advanced gaming experience. This includes an all new a smarter Artificial Intelligence, more all-round skilled players, and better graphics. Although FIFA has been dominating the field in console regarding graphics and license property it somewhat lacks when compared to the AI’s strategic manoeuvres portrayed in its rival PES. However, with this new FIFA, EA has embedded a more improved engine that delivers an enhanced team AI, along with offensive and offside awareness. Additionally, the Enhanced Hybrid Controls allow through gesture or button controls easier manipulation of the players and the scoring of more exciting and entertaining goals. 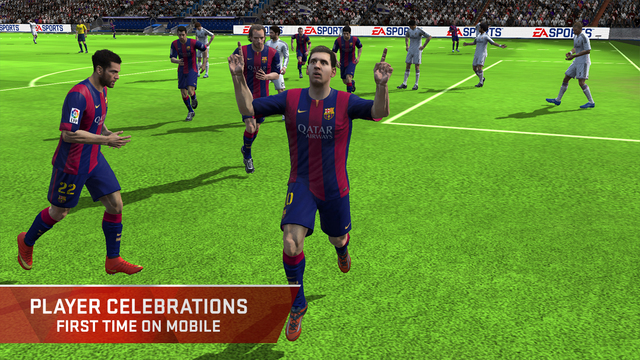 Player celebrations has been incorporated in the game for the first time on mobile; an addition that will surely impress fans. This new title maintains similar characteristics with its predecessors such as the hiring and firing of players to build your own unique favourite team. We also need to mention that the new FIFA 16 Ultimate Team comes free of charge with many in app-purchases. This new FIFA title also features the Build & Manage aspect where you can earn, trade and transfer celebrated football players like Messi and Henderson. You get to decide what type of play style, formation, or kits you want to advance in order to have the strongest team. You will be able to choose over 10,000 players from over 500 licensed teams, one of the advantage that FIFA has over PES, as previously mentioned. You will able to take all of this online and face off against other football players using real leagues in real arenas. In addition, you will be able to trade your players and items and if you are putting something valuable in this exchange, you get better upgrades in return. Finally, since its soft launch period, the game has immensely improved and looks like a worthy FIFA title for mobile devices. Although it no longer has its old name (EA SPORTS FIFA), FIFA 16 Ultimate Team sounds like a more appropriate title for it. The game will require 1.4 GB of free space and an internet connection as well. You can check the trailer for this game below.